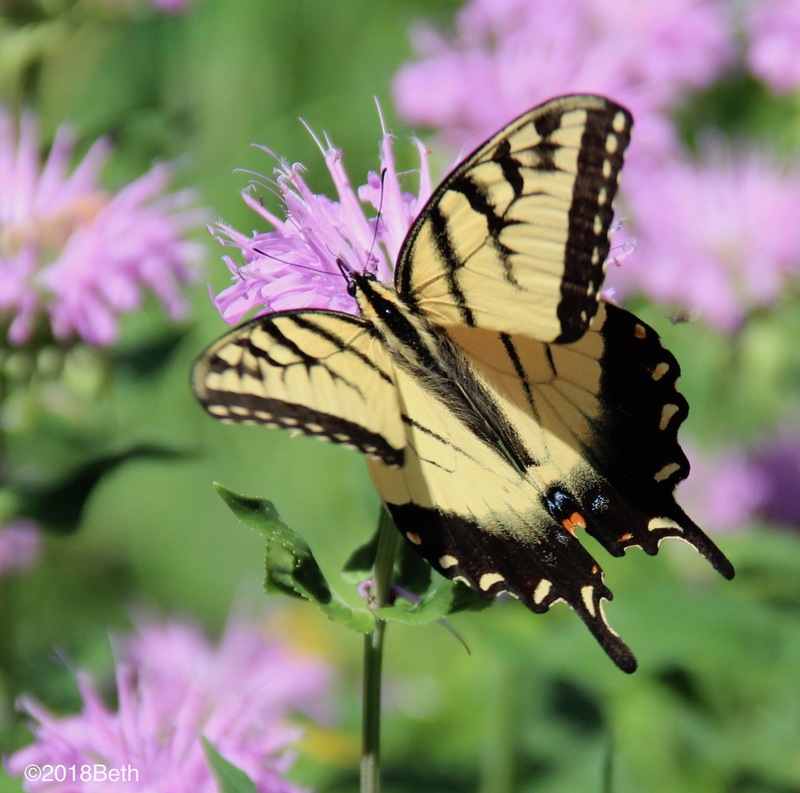 A male eastern tiger swallowtail (Papilio glaucus) butterfly. Our native monarda begins to bloom. One early-July afternoon, I read in the garden for a few minutes. It is so quiet with most of the neighborhood out-of-town for July vacations — I hear just the rustling of leaves and flowers in the breeze and a few mourning doves calling. A male eastern tiger swallowtail nectars in the monarda, and is so intensely focused on the blossoms that I walk right up to him with my camera. His wings are radiant yellow and unmarred, showing no signs of wear or age. The yellow glows when he dips into the shadows, and the scallops under his wings are vibrant orange and steely blue. 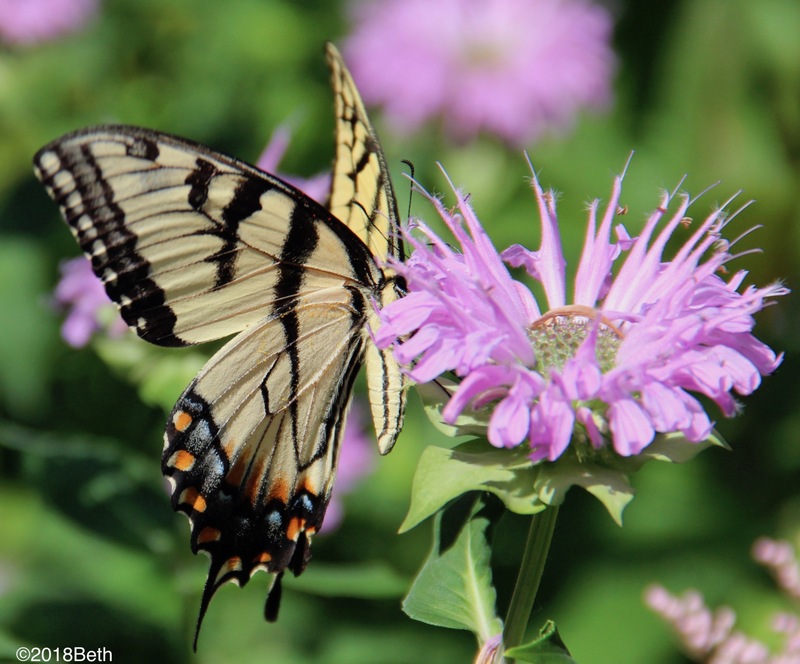 Underwings of an eastern tiger swallowtail on monarda or bergamot. Though he ignores the company, three red admiral butterflies and several bumble bees busily nectar in nearby blossoms. They, too, are absorbed with collecting nectar and are oblivious of each other and of me. Bumble bees (Bombus spp.) 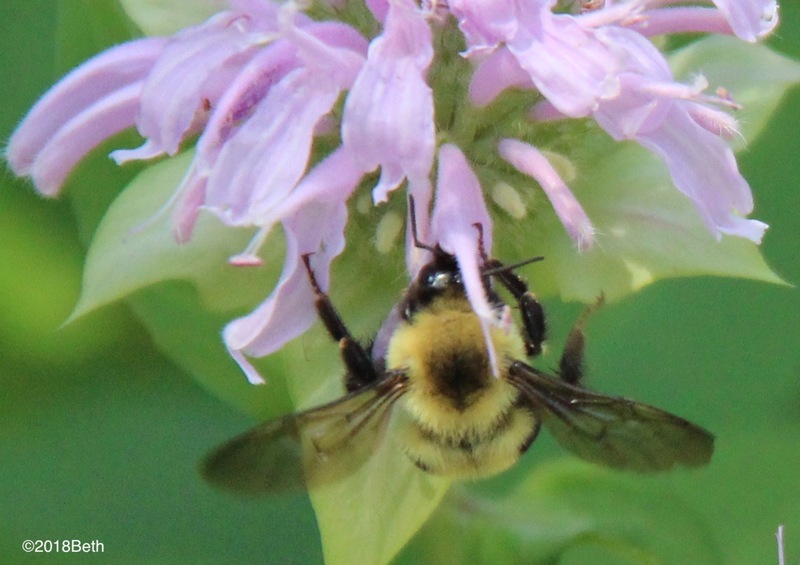 love the nectar of monarda blossoms. 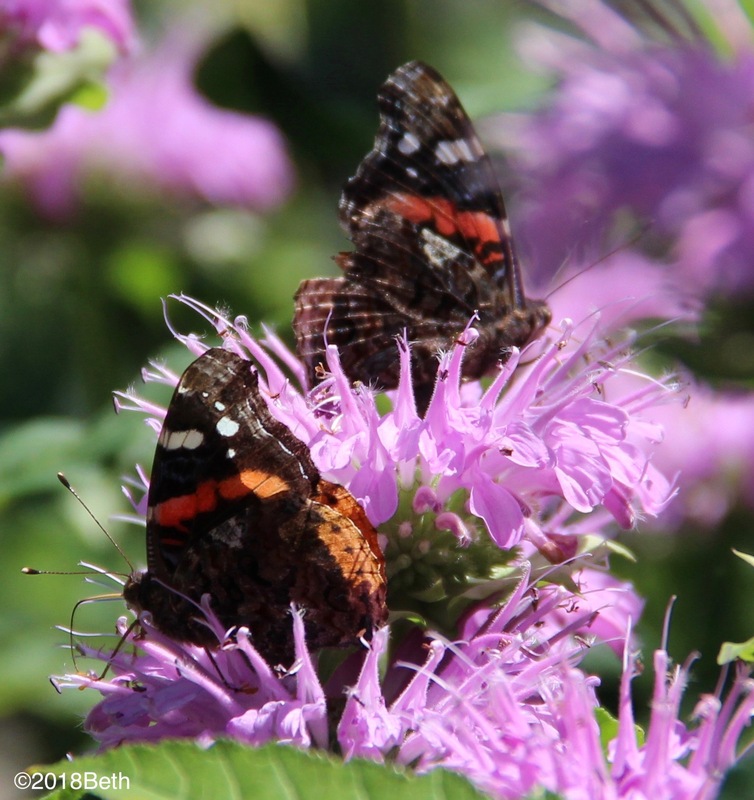 Red admiral butterflies (Vanessa atalanta) visit gardens from April through October before migrating south. This peaceful time on a warm summer afternoon is, for me, an active meditation on living in the present moment. It is a gift to share this time and space with such lovely creatures; to put aside frets and worries, to let go of the past and future; to just be in this one moment. 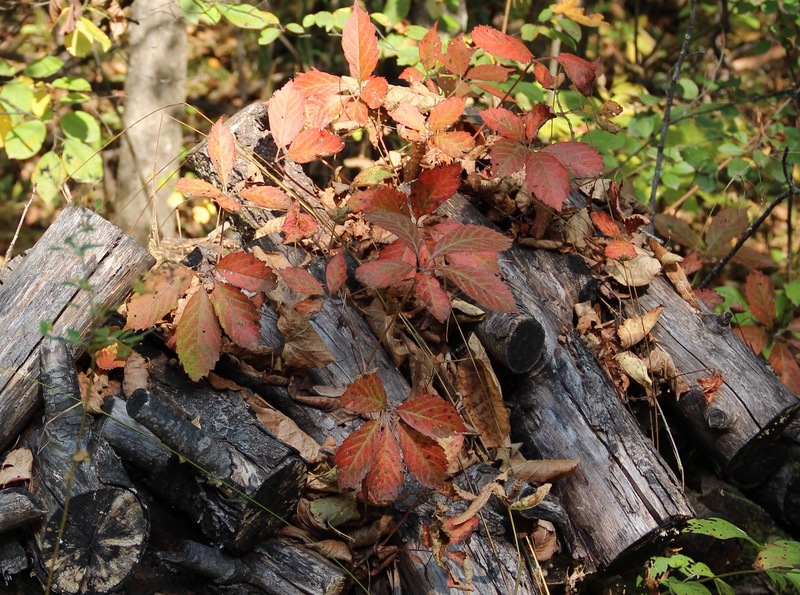 Grape woodbine vines (Parthenocissus inserta) weave color through an old wood pile. The warm, windy afternoon feels summery, but there’s no denying the first signs of autumn present in the woods and fields of Pine County in East Central Minnesota. I smell the sharp, earthy scent of crisp, dry leaves. Many trees are still green, but basswoods are shedding their leaves, silver maples are going gold, and red oaks show splotches of bright color. 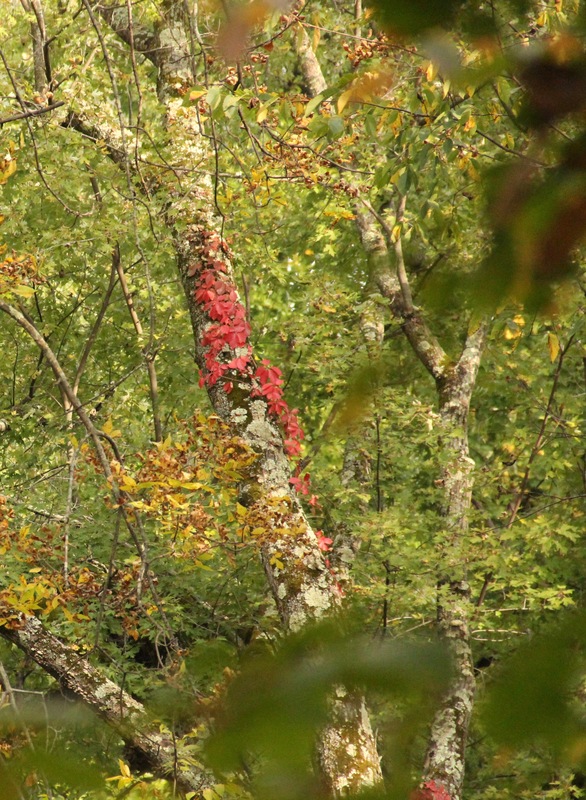 The most colorful leaves belong to the grape woodbine vines that climb over an old wood pile and thread scarlet up the trunks of many trees. Ripe acorns drop, swishing through leaves as they fall. Some hit hard like a rock; some bounce and tumble down the cabin roof; others plunk and splash into the water of the Snake River. Blue jays, chipmunks and gray squirrels scramble to collect and store the nuts for winter. The turf is also littered with hickory nuts, walnut husks and basswood nutlets. Grape woodbine and lichens light up the trunk of an old silver maple tree. 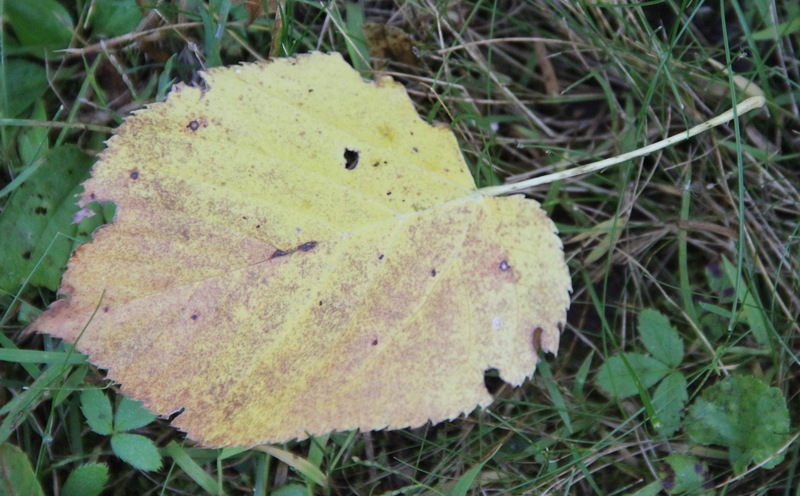 The large heart-shaped leaves of basswoods, or lindens (Tilia americana), are the first to be shed this year. 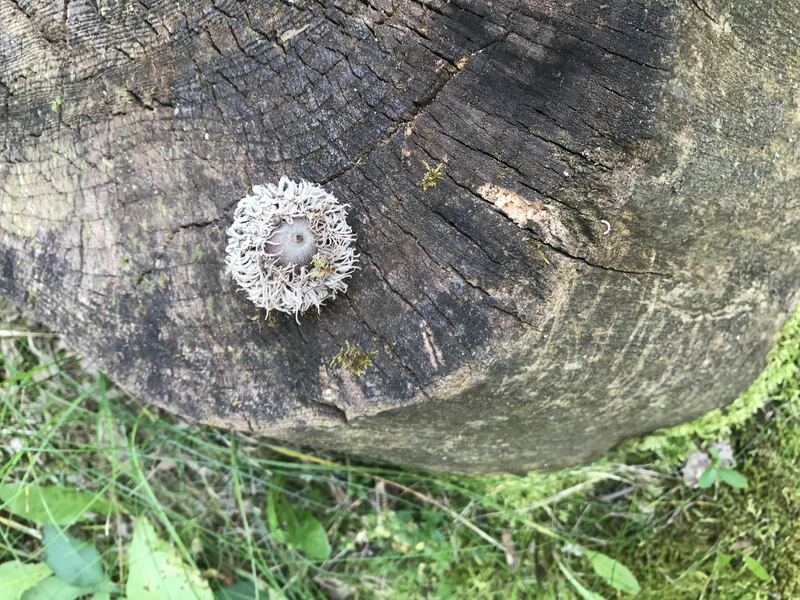 A mossycup or bur oak acorn (Quercus macrocarpa); the seed of a white oak that prefers rich, moist soil and grows along the riverbank. 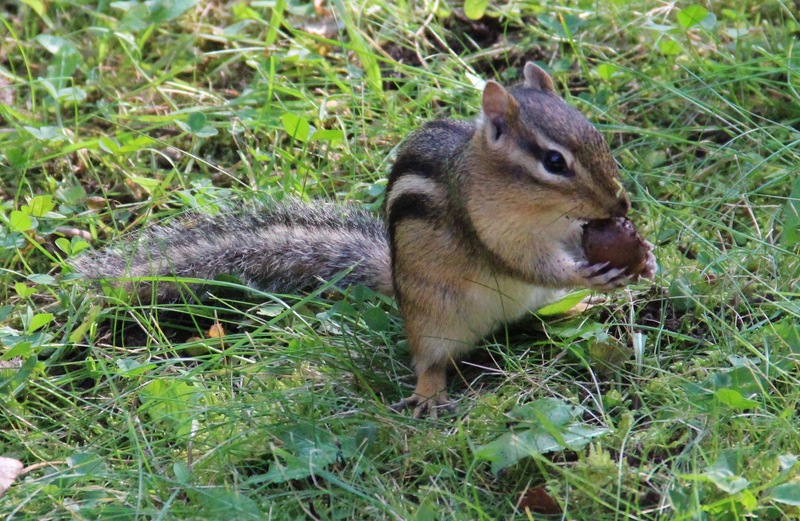 Eastern chipmunks (Tamias striatus) gather acorns, hickory and other nuts to eat over the winter. 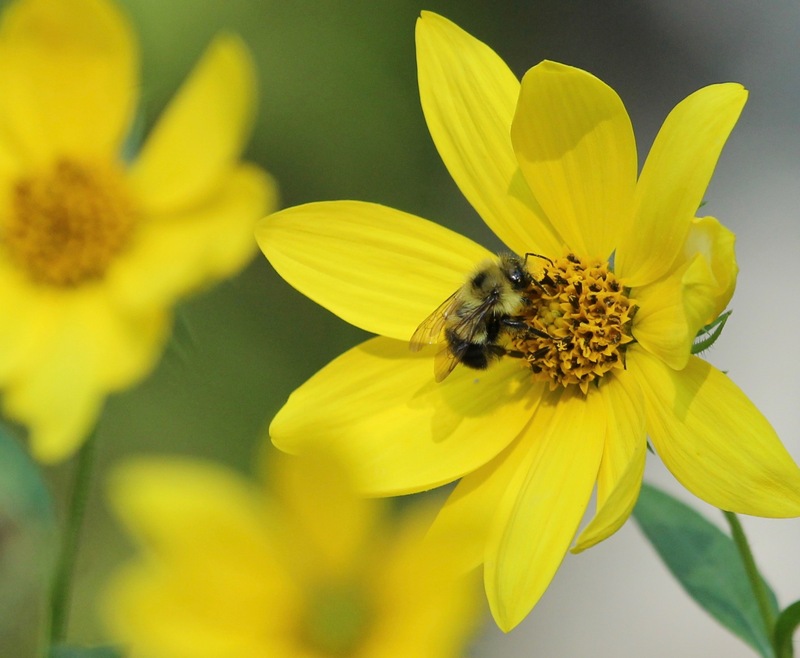 Roadsides and fields offer a bounty of autumn wildflowers — native asters, tall sunflowers, bottle gentians, Black-eyed Susan’s and a few others. Bees, wasps and painted lady butterflies hang like ornaments on the blossoms and the air is heavy with their busy drone. Mixed groups of migrating warblers hunt for insects, swinging like tiny acrobats on tree branches. The pesky gnats, mosquitos and other tiny bugs that annoy us fuel the warblers’ journey to Central America. A bumble bee (Bombus spp.) pollinates tall sunflowers (Helianthus giganteus). 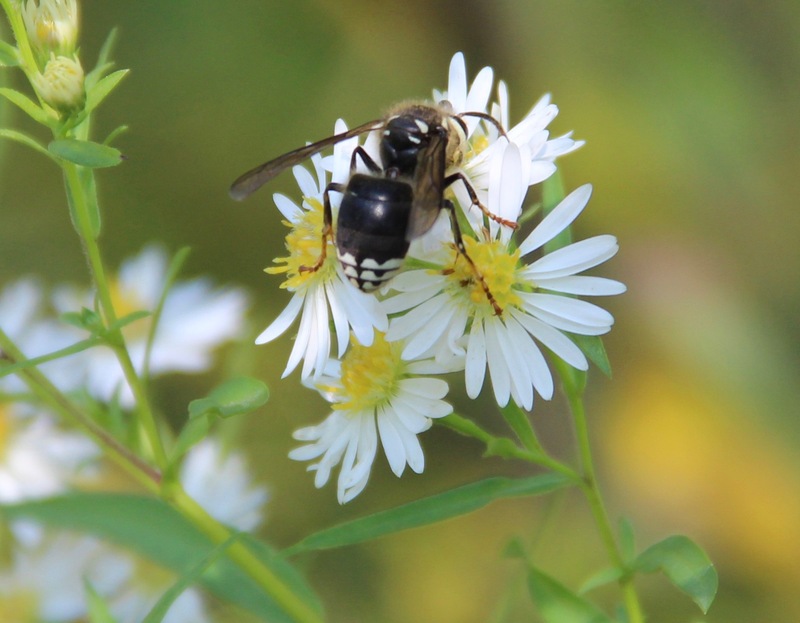 A bald-faced hornet (Dolichovespula maculate) drinks nectar from panicled asters (Symphyotrichum lanceolatum). 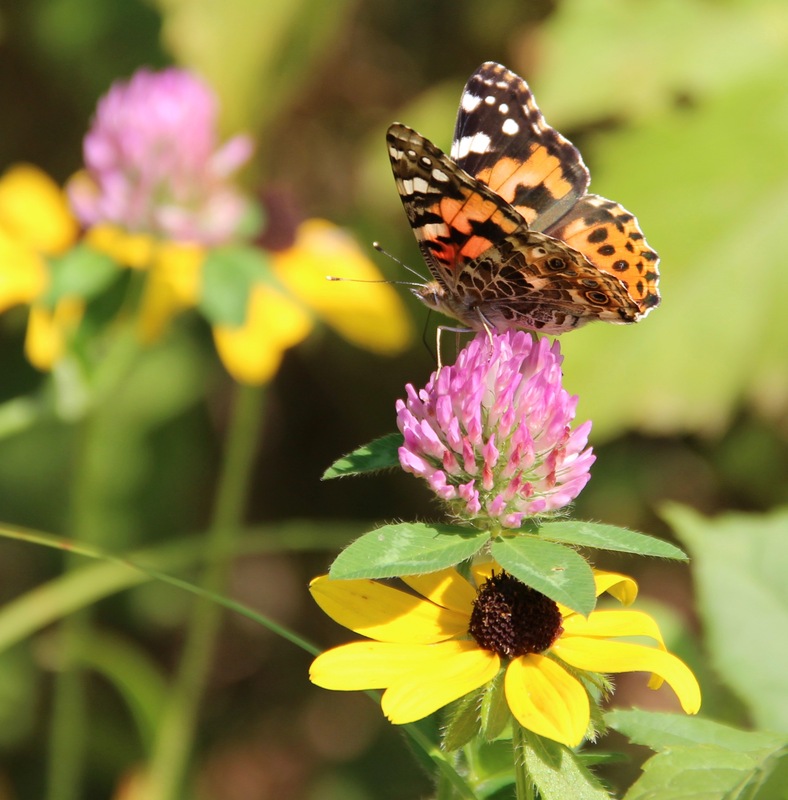 Painted lady butterflies (Vanessa cardui) are attracted to red clover, thistle and other autumn wildflowers. 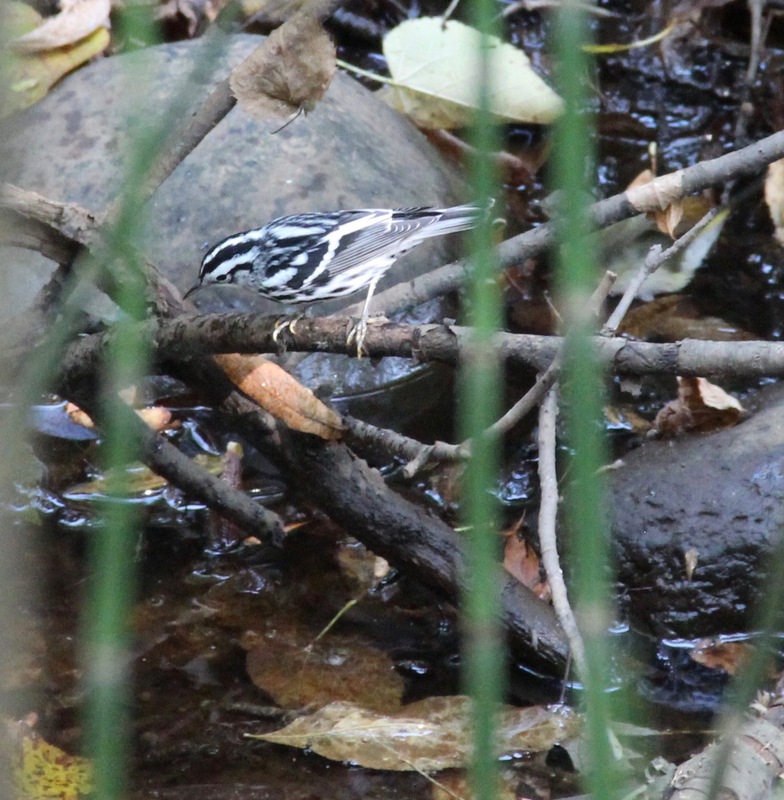 A bladk-and-white warbler (Mniotilta varia) hunts insects in the river shallows. In a few short weeks, all of this busy activity will disappear and the quiet of winter will descend. In the meantime, I hope for a long, warm autumn and will enjoy the changing beauty of trees, flowers, seeds and creatures. What signs of autumn do you notice? 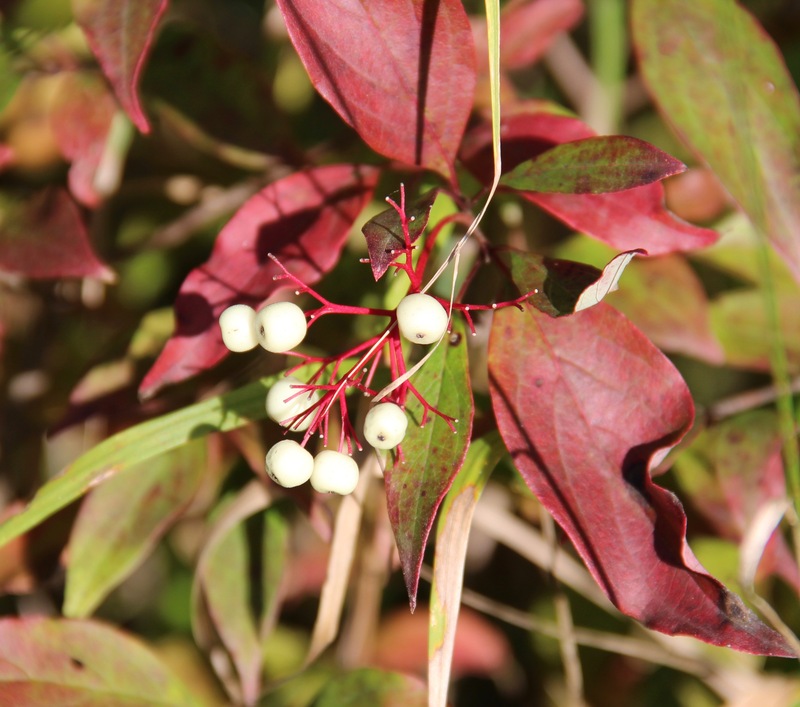 Gray dogwoods (Cornus racemosa) develop white berries and maroon leaves in autumn. The berries are a favorite food of grouse and pheasant.